1. To enter, upload your original recipe to Waitrose's Easy Easter Lunch Facebook application. The promoter accepts no responsibility for any incomplete, invalid, or illegible entries, or entries which fail to be properly submitted. Entry into this competition implies acceptance of these conditions. 2. Entrants must be UK (excluding Northern Ireland) residents, at least 18 years of age, and not employees of the John Lewis Partnership, their immediate families or anyone else connected with the promotion. 4. All entries must be submitted by 12 midnight on 9 April 2012. Illegible entries or those not in accordance with the rules will be disqualified. No responsibility will be accepted for any entries that are incomplete, invalid or fail to be properly submitted. 5. One winning recipe will be selected from each of the six categories: meat, fish, vegetarian, sides, gravies & sauces and desserts. 6. The six winners will be notified by email or phone within 7 days of the closing date. All reasonable effort will be made to contact the winner, however, if the promoter is unable to contact a winner within a reasonable period, an alternative winner will be chosen. We will only disclose winners’ details to a governmental body or agency. 7. The prize consists of an exclusive day at the Waitrose Cookery School on Tuesday 1 May for the six winners plus one guest per winner. 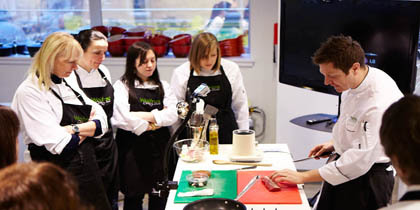 The event will be filmed for use on Waitrose.com, the Waitrose Facebook and Twitter pages and the Waitrose YouTube channel. By agreeing to these terms and conditions entrants agree to take part in this filming. The promoter agrees to pay reasonable travel expenses, when submitted with a valid receipt, up to a maximum of £100 per person. 8. If events occur that render the promotion or the awarding of the prizes impossible due to reasons beyond Waitrose’s reasonable control, it may, at its discretion, vary or amend the promotion accordingly and the promoter reserves the right to provide an alternative prize of equal or greater value in such circumstances. 9. The prize cannot be exchanged for a cash alternative. 10. The judges’ decision is final. No correspondence will be entered into. 11. The winner will be required to participate in reasonable press or PR activity related to the competition. 12. By submitting a recipe each entrant: (a) warrants and represents that he/she owns the rights to the recipe submitted and that the recipe submitted is: (i) original to him/her and has been legally obtained and created, (ii) does not infringe the intellectual property rights, privacy or publicity rights or any other legal or moral rights of any third party, and (iii) has not been published previously in any medium; (b) grants to Waitrose a worldwide, royalty-free, perpetual licence to edit, copy and reproduce the recipe on waitrose.com and in such other materials (including without limitation print, online and other media channels) for their own business purposes; and (c) agrees to indemnify and hold harmless the promoter against any and all claims, damages, expenses, costs and liabilities relating to trade mark, copyright, or other intellectual property rights, right of publicity, right of privacy or defamation. 13. We will never release your personal details to any company outside of the John Lewis Partnership for mailing or marketing purposes. In this instance, personal details are used for the purposes of awarding the prize draw prizes only.